Nava Graha Stotra by Sage Veda Vyasa...! I am writing this post on the Auspicious Guru Paurnima Day 22nd Jyly 2013 when my Poojas are done at the Holy Feet of Guru Shri Dattareya at Ganagapur....! The Guru Veda Vyasa written many Epics and Classics and Stotras which we are using in our daily lives as well as in all the Major Pooja Vidhi, Archana, Prathana Etc..! His Contribution is immense to The Hindu Dharma or Rather Vedic Dharma or Sanatan Dharma be it the Vedic Literature, The Mahabharata, The Brahma Sutras, The Bhagvat Purana and N-number of other Vedic Classics...! Today's Paurnima or The Guru Paurnima is Dedicated to Ved Vyasa and also termed as Vyas Paurnima...! I am posting here the Navagraha Stotra composed by him for all my readers with simple translation of mine...! The Stotras for the Navagrahas speak a Lot about the Grahas or Planets in coded Language, one needs to decode it to understand the simple sutras which has immense depth in it...! You can chant any of the Graha's Mantra written here to appease the specific Graha of your Kundali...! It gives immense positive results...! You can also chant the entire Stotra Daily or on some Specific Days of a Week...! I pay homage to the Sun, the bright shining One, the maker of the day, enemy of darkness, destroyer of evils, resembling a Rose, descendent of Kashyapa....! I pay homage to the Moon, Soma, who serves as an ornament on Shiva’s crown, who was born from the ocean of milk and whose color is that of curd, conch, or snow or water…! I pay homage to Mangal, the handsome youth with weapon in hand, Born from mother earth, whose luster resembles the lightning in the sky...! I pay homage to Budha, son of the Moon, resembling the dark green bud of the Priyangu flower (millet), unrivaled in beauty, of calm and collected disposition...! I pay homage to Brihaspati, the guru of Gods and Rishis, who shines with golden luster, the embodiment of cosmic intelligence, the guiding light of the three worlds...! I pay homage to Shukra, descendant of Bhrigu, the supreme Guru of the demons, the greatest Expounder of all Shastras, whose complexion resembles the white lotus, the jasmine flower, or snow...! I pay homage to Shani, the slow moving, son of the Sun, born from Chhaya and Martanda, Yama’s elder brother, who is of dark complexion like the blue eye ointment (Kajal or Collyrium)...! I pay homage to Rahu, the half-bodied one, offspring of Simhika or Lioness, possessing great strength, the sworn enemy of the Sun and Moon...! I pay homage to Ketu, one of the eleven Rudras, chief among planets and Stars, resembling the palasha flower, and of dreadful appearance...! Thus ends the hymn of praise to the nine planets, born from Vyasa’s mouth as assembled by him. For one who chants this hymn, whether by day or night, all obstructions will melt away...! Whether for men, women, or kings, it brings them destruction of evil, unrivaled sovereignty, freedom from disease, and growth of strength...! All afflictions born of the planets, stars, thieves, or fire will be removed. Vyasa tells us that there is no doubt about this...! Thus ends the song of praise of the nine planets composed by Vyasa...! Online Vedic Astrology Course through Google Hangouts...! Here we are announcing the first of it's Kind, Online Vedic Astrology Course for people interested to Learn this Divine Shastra across the Globe...! You can be from any City, Province or Country...! You Can be of Any Nationality..! You Can be of Any Gender..! No need to search for a Good Astrology School or a Guru..! Your Search Ends Here..! You will Learn through Google Hangout Webinars, Sitting at your Home or Office in Comfort, Directly on "One on One Basis"...! Audio - Video real time Lectures by Shri Dilip Raut Ji...! Here are the details of the Course.. Registration: 365 days Open, Just shoot an email, agree on the Fees, Pay the Fees and the Notes will be dispatched to Your Address. Once You receives the Notes, we will start the course..! Notes & Literature: Printed English Booklets of all the topics will be couriered to you in advance before the course commencement, on Payout of the Fees. No extra Books need to be bought for the course, all the study material will be provided beforehand and can be used in Online Lectures...! Technical Requirements: You need to have a Webcam & Internet enabled Computer, Laptop, Tablet etc with Microphone and off course a Gmail ID for having you in the circle of Google Hangouts..! Title : A Title of "Jyotish Acharya" will be conferred and the Certificate of Course Completion will be sent to you by Courier or Indian Registered Post...! 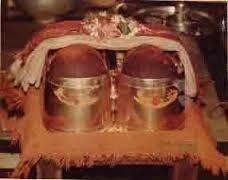 Guru Paurnima 22nd July 2013 - Guru Dattatreya & Mother Mahalakshmi Pooja...! On this 22nd July it is Guru Paurnima, The Day to worship The Guru who enlightens our Life and Guides us on the right Path…! We should Express our Devotion and Surrender at the Holy Feet of Guru Dev. In Guru GeeTa, Lord Shiva Tells the Famous Verse We All Know, Chant or Heard in Temples as follows..
Lord Shiva Tells Mother Parvati, That Guru is The Brahma, Guru is the Vishnu, Guru is the Maheshwara or Sakshat Shiva… and this combined force of Brahma, Vishnu and Shiva is the Supreme Force of the Universe, The Parabrahma..! This Supreme Force of Parbrahma, The Trinity is the Strongest Force of the Universe and it is Lord Dattatreya or Shree Guru Dev Dautta…! Further Lord Shiva Tells Mother Parvati that the Worship or Pooja of Guru’s Lotus Feet is the Supreme Offering to Get Blessed By the Guru Dev in following Verses..
All Sins are purified by worshipping Guru’s Lotus Feet and The Pinda or The Body get’s attuned to The Brahmanda by the Grace of Guru Dev..! Lord Shiva further Ads, Don’t forget to Apply The Holy Waters of Guru Padya Pooja (The Tirtha) on Your Forehead and sprinkling it on your Head…! With this single act you get the Punya of Bathing in All the Holy Rivers Like Ganga, Godavari Etc…! With The Radiant or Tejomaya Wisdom or Pure Gyan of Guru one will be saved from the Dungeon Or Mud, Murk of Life and With the Holy Water of Guru Padya Pooja, one will be sailed through smoothly from the Bhava Sagara or in this Journey of Life…! And in Many more Verses Lord Shiva recites the Greatness of Guru and Especially The Padya Pooja, the Pooja of Guru Paduka, The Pooja & Worship of The Holy Lotus Feet of Guru Dev…! Every One Must Touch the Holy Feet of their respected Guru, Be it a Teacher, Friend, Guide, Philosopher, Astrologer, Spiritual Master or Even an objects which inspires and motivates You…! Just Bow down to those In Gratification as they have had taught you something which gave You some Knowledge, Some Gyan which will help you in the Journey of Life…! 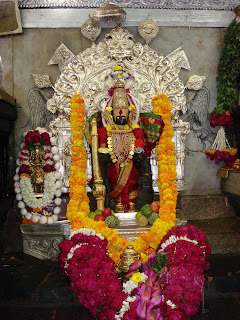 On This Day we will be carrying Out Shri Guru Dattatreya’s Padya Pooja at Ganagapur, In Karnataka. 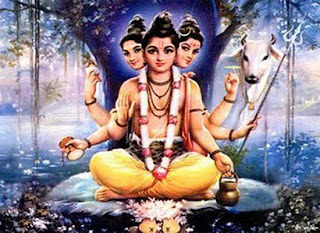 Dattatreya is the Guru Dev, Lord Shiva describes the Guru as Brahma, Vishnu and Mahesh, The Strongest Force of TRINITY and the Aadya Guru, The Master of all Masters, The Supreme Master, The Supreme Lord, The Param PeeTa Parmeshwar…! Shrimad Bhagwatam describes the 24 incarnations or Avatar of Lord Maha Vishnu and Guru Dattatreya is one of the Avatar of Shri Maha Vishnu…! So A Guru Dattatreya Padya Pooja is something Very, Very Special on this Occasion…, So go ahead and get the advantage of this Pooja Vidhi..! If you want to offer a Pooja on your behalf and get the Prasad at your Home, You can book the Pooja from our website www.bhaktidhara.com by registering and going to the Online Pooja Page and clicking on the Guru Paurnima Pooja Link..! It will redirect you to Paypal Payment Gateway and You can pay the Dakshina online by using your credit or debit card…! On Guru Paurnima, You can also offer Pooja to Mother Mahalakshmi, at Siddha PeeTha Kolhapur…! You can book the Mahalakshmi Pooja in the same manner described above…! Labels: Ganagapur Guru Dattatreya Pooja, Guru Dattatreya Padya Pooja, guru dev datta, Guru Padya Pooja, Guru Paurnima 22nd July 2013, Guru Paurnima Guru Pooja, Guru Pooja on Guru Paurnima, Pooja of Guru Paduka..